Almuñecar is located on the Costa Tropical in Spain. Almuñecar is a beach resort with such fabulous weather that the climate is less Mediterranean and can best be described as sub-tropical. With more than 26,000 inhabitants, Almuñecar has good transport links and a football stadium. Are you an expat in Almuñecar? What do you like/dislike about it? Let us know in the comments box at the bottom of the page. Historically, Almuñecar dates as far back as 800BC and was settled during Phoenician times. Almuñecar is rich historically and this is much in evidence in the architecture where you can see Phoenician remnants of the fish market, as well as Roman, Visigoth and Muslim remains. To book flights to Almuñecar you have the choice of booking flights to Malaga International Airport on the Costa del Sol which is the closest gateway or to Almeria on the Costa Almeria a little further away. Almuñecar has over twenty different beaches stretching from the resort to neighbouring La Herradura. The best beaches to visit are Playa de Cabria, Playa El Pozuelo, Playa El Tesorillo, Playa Velilla, Playa Puerto del Mar, Playa san Cristobal, Playa de Cotobro, Playa del Muerto, Playa del Berengueles, Playa de la Herradura and the Playa de Cantarrijan. For some water park fun you can head to the Aqua Tropic Water Park which is open from June until September and prices start from as little as €11 for an afternoon ticket. For more information, special offers and exact opening times you can browse their website on www.aqua-tropic.com. The nearest golf courses are thirty minutes away by car in Motril and Rincon de la Victoria. Although Almuñecar isn’t a massive tourist resort, it still has more than one hundred restaurants of which the top ones to dine out at according to the Trip Advisor are El Chaleco, Arbol Blanco, Meson Francisco II, By Larios Argentino Steak House, Los Geranios, Café Ayer, Reina Sofia and Mar de Plata. Popular Almuñecar drinking holes to visit are the Café Pub Mississippi, Café Bar Ayer and Pub Rincon del Mar. Almuñecar does have quite a good selection of bars and discos when it comes to enjoying the nightlife. Highly recommended are the Restaurant Discoteca Bar Atillo 15, the Sirena Café Copas Bar, Rincon del Mar, Disco Versatil and the Disco La Cochera in La Herradura. Things to do in Almuñecar which are a little different than most Spanish costa holiday resorts include the Bonsai Garden Museum as well as the SailandStay Day Tour. For more information on the sailing trip which is to be recommended you can look at www.sailandstay.eu. For more information on the Bonsai garden Museum you can browse their site on www.nerjarob.com. If you are looking to book a hotel in Almuñecar then you have forty to choose from and rates start from as little as €35 a night and voted the best accommodation by visitors on the Trip Advisor are the Iti Playacalida Spa, Hotel Almijara, Hotel Casablanca, Almuñecar Playa Spa Hotel and the Victoria Playa Hotel. If self catering apartments or villas are more appealing then the Apartamentos El Tranco del Mar which are located on the Calle Baja del Mar are very close to the sea front and start from as little as €70 per night, have been well reviewed by past holidaymakers. Villas with swimming pools are also available to rent by the week from around €400 a week. Almuñecar is the place to come for a fabulous family beach holiday and even families with teens will find that there is enough for them to do to keep them happy. Palacete La Najarra, Avenida de Europa, s/n, 18690, Almuñécar (Granada). Martin, what would you say would be the advantages to living in Almuñecar compared to other Costa del Sol towns? Sun. Sea. Mountains. Almuñécar lies in the shelter of the Castillo San Miguel, an impressive fortress developed by the Moors. At the centre of the “Costa Tropical” this seaside town enjoys a microclimate, subtropical in character – which unlike the extremes of the Costa del Sol offers a warm and gentle 18 degrees in winter and averaging a comfortable 28 degrees centigrade in summer. Thanks to the motorway networks we are just 60 minutes from Malaga and Granada airports, and for winter skiing just an hour and half from the slopes of the Sierra Nevada. Primarily Spanish, despite a steady influx of cosmopolitans settling in the region, there is always something to do for everyone, and particularly children – with a local water park, public gardens, sailing, scuba diving, water skiing, tennis, horse riding, golf and hang gliding to name just a few of the leisure activities available. This is difficult to answer as I have lived here since the late 90s. Pace of life… is still much slower here than most parts of the Costa del Sol. It is probably the number one complaint of most Westerners re-locating here, that they soon grow to be frustrated by the mañana (maybe later or tomorrow) effect. Then second would be internet speeds we don’t have cable or fibre but hopefully will receive 4G soon. While we offer more than 20 kilometres of beaches along the Costa Tropical, the majority are shingle rather than sand; and that may put some people off, I suppose. However, because many beaches are flat, with several bays protected by surrounding high cliffs, then we have three locations that are a magnet for naturists. We don’t have too many high rise blocks, nor too many International foreign run bars either. We are predominantly a Spanish town that happens to be by the sea. More than 80% of the local population are Spanish but this can fluctuate between 10 or 20 per cent during the winter months when the foreign owners return to their holiday homes, or come to rent for 4 to 6 months. Here the main language spoken widely in the street is Spanish first, then French, then English followed closely by Scandinavian speakers. Whenever possible, a quick 15 minutes drive along the coast takes me to the 18 holes of “Los Moriscos” golf course next to the beach, and east of Salobreña. Popular with residents and holidaymakers alike this year-round course offers a world class restaurant in the club house too. Like most Spanish families, eating out and fine wines are our greatest pleasures. We have a wealth of very good bars and restaurants to choose from, but more on that later. We also have an award winning winery “Calvente” that offers Moscatel of Alexandria, Cabernet Sauvignon, Syrah, Merlot and Tempranillo; but the real star, and the estates biggest seller, is its white wine, of characteristic and quite complex flavour, blended with grapes of La Guindalera on the slopes of the Sierra Nevada, it is a real joy and well worth hunting down. Whether its “a la brasa” meat or fish cooked over a charcoal fire at one of the beach chiringuitos, or traditional tapas trails visiting many of the established bars dotted around the heart of the old town, Almuñécar offers plenty of choice, well priced and at a very good standard too. Businesses here are very proud of locally produced fruits, vegetables and cheeses, as well as the rich supply of game that appears on menus in the late Autumn. Today the visitor will find that we have a Michelin listed restaurant, various quality “Meson” Bistro-style eateries, and plenty of traditional Spanish and International restaurants offering both traditional plates or more experimental tasting menus. Here are just a few names of some of my personal favourites: Meson Emiliano, Ultima Ola, Chaleco, El Arbol Blanco, JR, Taberna Ayer, Francisco 1, La Tartana, Reina Sofia, Sabina, Venta Luciana, Los Geraneos, Jesus y Lute and for breakfasts – our neighbours – Bar Casablanca. Almuñécar became a quiet retreat for Europe’s International jet set including stars of screen, stage and industry in the 1960s. And, over the years the town has established itself as a popular but tranquil Spanish resort so much so that we have a very good health infrastructure, a public health centre open 24/7, several pharmacies, private specialist practices, and dentists. There are two spa centres, several gymnasiums and dance studios. Supermarkets, shops and specialist food shops that cater to the International community year round. Almuñécar may not be able to offer the choice of shops and products like its nearby towns of Malaga, Motril or Granada but we still have traders specialising in household soft furnishings, decoration, shoes, beds and bedding, white goods, and much more. Re-locating here will be different but not difficult. The municipality of Almuñécar includes the seaside village of La Herradura and the leisure port of Marina del Este. From Almuñécar, taking the A-4050 northwards, the Carretera Suspiro del Moro (or La Cabra, as the locals call it), literally hugging the banks of this fertile Rio Verde valley you will arrive at Jete, Otívar and Lentejí villages. The route has more recently become a popular tourist drive as it snakes up the valley and over the mountains onwards to Granada city. Protected by the river Verde, that links the villages through kilometres of subtropical fruits and rich vegetation, the local communities here still continue to farm a rich variety of tropical fruits and plants that are exported the world over. For the sport lover too there is much to do – you can enjoy trekking, para-gliding, gorge climbing, walking and even caving here, the cave of the Perro, near the village of Lentejí (Lentegi) is more than 90 metres deep. Food connoisseurs are also well provided for, with plenty of restaurant opportunities available to discover traditional local dishes based on meat and fish. During the winter hunter’s months, there is a rich variety of excellent game dishes to enjoy. Established in 1989, the AIS (Almuñécar International School) currently has more than 330 pupils on roll with the British curriculum divided into 4 sections, Primary under a Head of Primary and Key Stages 3, 4 and 5 under Key Stage Co-ordinators. The Spanish curriculum is overseen from 3 to 18 by their Directora Tecnica with the current head teacher, Fiona Jacobs, taking overall responsibility for the whole school. All this is in addition to both class and subject teachers. Pupils are therefore constantly monitored and encouraged. In Spanish their progress depends on age and motivation. Those who join us in Primary nearly always leave us effectively bilingual. Those who arrive in their teens, sometimes unhappy to have been uprooted, take longer. If students are motivated and don’t live in a British “bubble” in certain urbanizations, they find it possible to join the first language Spanish groups very quickly. We have both a local police station and a Guardia Civil post located in the town… with a resident population of 28,000 that increases 3 fold in the summer months then we need these officers to manage traffic, boisterous behavior in late night bars and general petty “opportunistic” crime that occurs in places where there are large groups in public areas like the Friday and Sunday markets, Jazz festival, Fiesta de Carmen, San Juan and the towns feria in August. Serious crime here is, like in most parts of Spain, very rare. 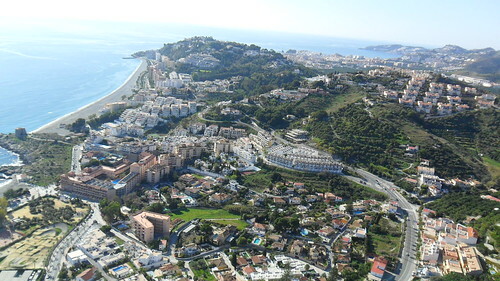 Unlike many parts of the Costa del Sol that have seen large price falls, here in Almuñécar while there has been some shift down, we have not experienced the falls of over 30 percent as generally reported. The main reason being that with more than 60 per cent of our buyers being Spanish, and the fact that we do not have the expansive urbanizations or golf complexes as other Costas, then the types of property we have to offer are far more residential rather than touristic. People tend to buy here in Almuñécar for the tranquil Spanish way of life rather than just for the beach; and a large majority of our International buyers look to purchase something that is more than just a holiday base but somewhere they can spend months in, and usually before re-locating or retiring. Given recent events with UK and Europe… and the current strength of the Euro as a result then British buyers will find that property prices here are a little more expensive than they were prior to June 24 2016. This may stall the market for a while, and we may see more British owners adding their properties for sale. But as our market is primarily Spanish, French and Scandinavia then they will still be looking for a bargain. We have dealt with several bank repossessions over the last 12 months but it is our experience that the bank quoted “offer” price is usually non-negotiable, the process often takes many more weeks longer than the usual re-sale, the property has more often than not been cleared of all fittings, and that any debts such as community charges, town hall rates, utility charges are not cleared by the bank. Thus making negotiation with the “seller” a far more complex issue. Occasionally we do get a bargain property, but then they tend to move quite quickly as interested buyers will have already shown an interest in the particular location and be ready to move forward with a swift purchase – and they almost always tend to be cash buyers. As I mentioned earlier, Almuñécar has not seen the kind of urban development’s as many of Spain’s Costas, and as such the municipality is more about location and district rather than what particular urbanisations have to offer. That is not to say that we do not have some – Fuentes de Almuñécar, Santa Cruz, Costa Banana to name a few – but here the buyers go for specific locations. Still the most popular is the historic quarter of San Miguel at the centre of the old town of Almuñécar, and which has been declared as being of such cultural importance that there are now strict planning regulations to help retain the old charm of the traditional white washed houses. Other areas include Los Pinos, especially the villas close to the International school; the residential area of P4 apartment complexes built between 2000 and 2004 largely attracts Spanish clients from Granada, Jaen and Madrid; Cotobro, a community of independent hill top villas some dating back as far as the 1940s; and then there is Punta de la Mona, Figares, Cerro Gordo, Citasol and El Nogal attracting clients with much larger budgets to spend! How much are typical property prices in Almuñecar for apartments, villas etc? Tropicana has been operating on the Costa Tropical since 1999, and if we take 2008 as the real estate turnaround when prices and buyer numbers began to fall and property volume increased then today there is some slight shift in improvement. Here the excess of property for sale on the market has had some effect but not as much as other towns and Costas. 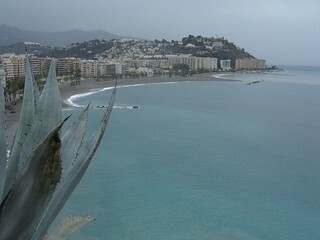 For example a typical sea front 2 bedroom apartment in 2008 selling for 210,000 euros will now be around 170,000. A typical 3 bedroom townhouse in the old town selling for 175,000 euros in 2008 sold for 120,000 this year. And a villa in Cotobro for 480,000 euros in 2008 recently changed hands at 365,000. Today our cheapest sea front studio apartment starts at 70,000 euros, a modern 1 bedroom apartment in the town centre for 100,000 euros, and we have 3 bedroom villas starting from 220,000 euros. Any tips and advice to people looking to buy in Almuñecar or surrounding area? If you are serious about investing in property in Spain then you should not just be looking at the price but also the location and the facilities, the history and culture available to you, and of course appreciate your willingness to integrate with the local community. While it is possible to spend your time here not speaking any Spanish, by doing so you will miss out on so much… The experience of life in Almuñécar and the surrounding villages and communities will be improved by just learning a few Spanish phrases. So you should make that one of your priorities, I think. Finally, as many of our clients have discovered for themselves, it is often better to rent a property for a few months and then look around the area to be sure which locations appeal and which do not, which get the sun in winter and which get the sun in summer, which residences are popular holiday accommodations and which are more residential, the amenities available close by, transport and local bus service options, etc… will all influence particular requirements – especially when making such a lifestyle change. It’s all about getting it right from the start and not finding out 2 years later that maybe that fourth floor 2 bedroom apartment with terrace would have been a better choice than a 3 storey townhouse with roof terrace up the hill! Martin, thank you so much for taking the time to help our readers with your experiences in Spain. If you want to contact him, you can find his details below.